Brazil playmaker Kaka will take advantage of his red card against the Ivory Coast by improving his fitness. Kaka was handed a one-match ban after receiving a second yellow card for a seemingly innocuous collision with Ivorian midfielder Kader Keita. "I'll use this time to continue working on my physical fitness," said Kaka, whose side qualified for the knock-out stage following their 3-1 win. 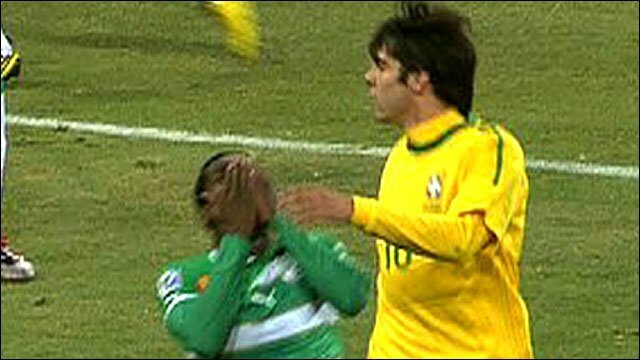 Brazil's chiefs have not yet appealed against Kaka's red card. However, the Real Madrid star is hopeful that football's world governing body will take a look at the controversial incident, which saw Keita clutch his face and fall to the ground dramatically after running into him. "The images tell it all. I hope Fifa looks into this," he added. Meanwhile, Brazil coach Dunga described the sending off as "unjustified". The former World Cup winner said: "The player who commits the foul escapes the yellow card, I have to congratulate him for that. "It was a totally unjustified dismissal of Kaka, he was fouled and yet he was punished. "It was a very complicated game, a very physical game I might add. There were many fouls committed and all of us, who love football and desire beautiful football, always ask that the beautiful game is controlled. "We have to know what is good football and what is not. So when the referee allows certain fouls or certain incidents to go unpunished that is not right. "I must actually congratulate that Ivory Coast player. "We played much better than Ivory Coast and received more yellow cards than our opponents without really having committed any serious fouls. "So we are left a little bit in doubt. What do we really have to do not to receive these yellow cards?" Prior to that, Kaka - who in the build-up had been the focus of much speculation regarding his lack of form - showed glimpses of the player who was named World Footballer of the Year in 2007. He put Luis Fabiano through for the striker's opening goal and played a role in Elano's second-half strike. Fabiano, who scored twice, admitted to using his hand in the build-up to his second goal. "Well that is true, it seems as though the ball hit my hand," he said. "It seems the ball hit my hand and the second time it hit my shoulder. "But in order to make the goal more beautiful, there had to be a doubtful element. It was a spectacular goal and I believe it was not a voluntary handball. "It was a legitimate goal and it was one of the most beautiful goals that I've scored in my career. "It was magnificent and where better to score such a goal than at the World Cup?" Meanwhile, Elano seemed to suffer the most from the Ivorians' physical approach as the former Manchester City midfielder left the field on a stretcher after injuring his right ankle. The midfielder screamed with agony after Cheik Tiote's over-the-ball challenge. However, Brazil doctor Jose Luiz Runco said the injury was not serious and believes Elano could be fit to face Portugal.